A rambling online help for those who are trying to find information on wire working and metal working. I love doing the articles but don't want the limitation of publishing in magazines, so here you are - Amanda writing free information on how I discover new techniques in my jewellery journey. I have wanted to do a complex pendant that incorporates a number of weaves I have on my free tutorials page. Half to show off how the weaves can work so well together in a project but also as a challenge for myself to step up the game. 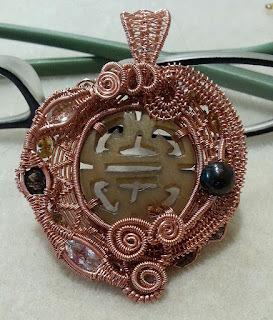 The other goal was to create a pendant where the back is as appealing as the front, since many I've done definitely have a back side to remain hidden. One artist I always admired was able to trap a faceted stone in what looked like the Basket Weave. I've thought long and hard on the revere engineering of it and finally came up with the idea to combine the Basket Weave with the X-Wrap weave. I started with 0.6 mm core wires and 0.3 mm coiling wire. For basket weave, half round wire is 1.0x0.5mm. I wanted a wire base that was fine and easy to mould with my fingertips. 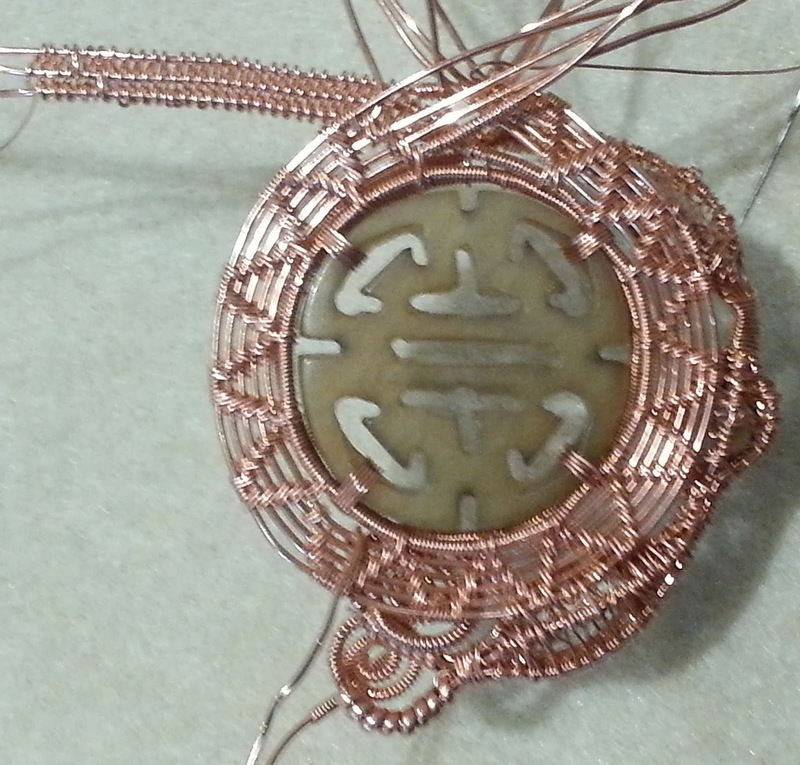 I used the three core wires to create a base or dish that the stone would sit in with X-wrap modified for 3 wires. 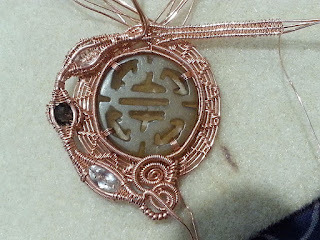 I had to V-shape the middle one to create a pocket for the point of the stone since it isn't a flat cabochon. The idea here is the half round top wires from the Basket Weave are used to set the stone in place. 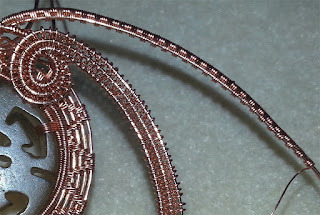 With the two half round wires laying together, they are held by a coil 0.3 mm wire that then switches to Figure 8 weave as the half round wires separate. 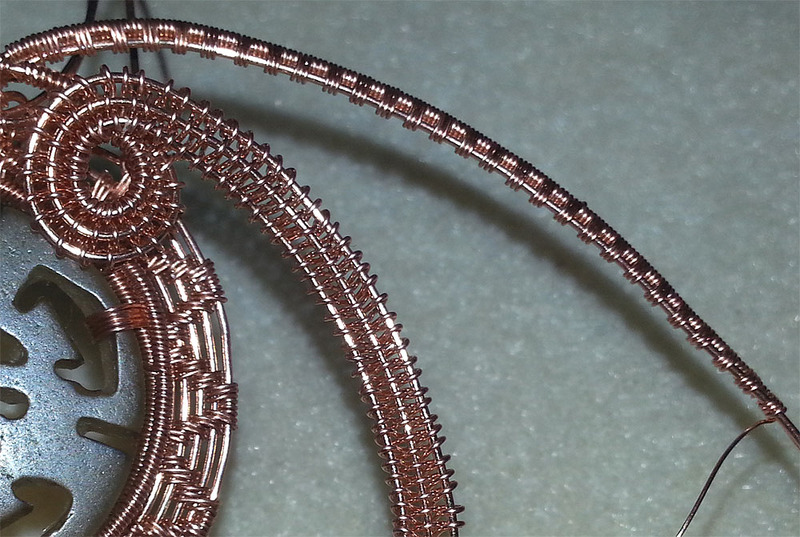 I was not able to do the Figure 8 on the half round on the opposite side when the half round wires decreased and came together again. Kept slipping. So I started at the far end where the wires came together and worked backwards. Worked a charm as the coiling wire didn't slip. On top of the stone where the X-wrap ends, I anchored the coiling wire around the half round wire to the underside base. You can see the anchor points in the photo below. The back of the stone setting is really interesting too. 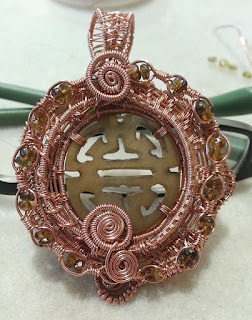 I also found as I progressed into a more complex pendant that the middle wire makes a great place to anchor or terminate other wires inconspicuously. Here are the actual original 3 stones I started with, three amethyst faceted ovals. I put a lemon quarts oval on each side to keep practising with different sized stones. The stones look green here, but the larger ones are yellow quarts faceted oval stones. I also found the narrow basket weave sections made for great bending points. After folding this one up, I fell in love with the shape of the negative space and decided to finish off the pendant as is. The back is as interesting and appealing as the front. Onto the next pendant, because originally I wanted to put the Jade carving into a pendant with the purple stones. 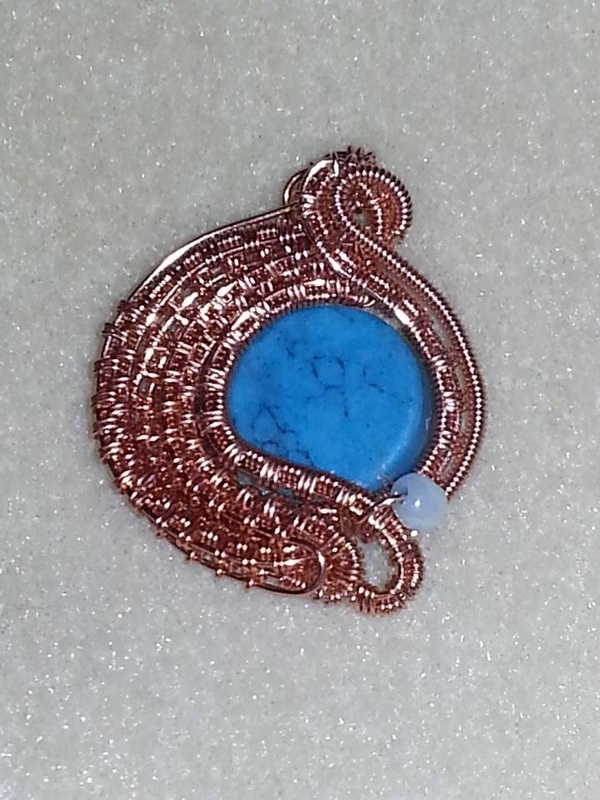 So I hit my stone stash and found a tans/browns combination for a new pendant idea. 1st. I captured the jade stone in a 3 round bezel setting. 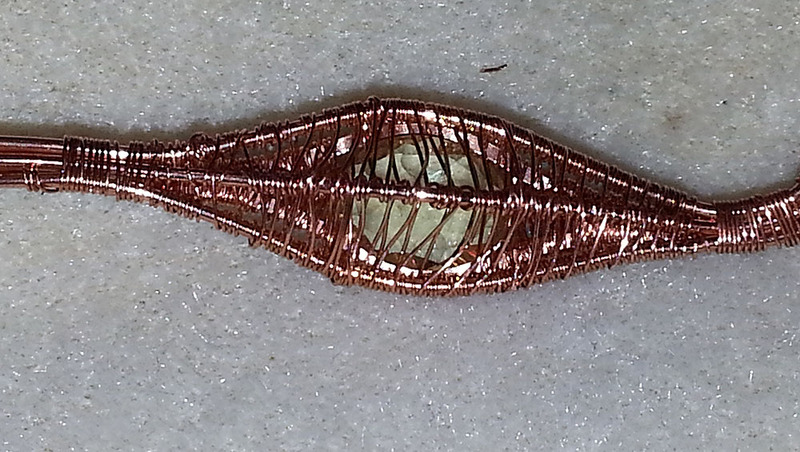 I used 0.6 mm core wire and the 0.3 mm coiling wire again. The bezel frame was attached to the jade carving disk on the final rotation on compass points. 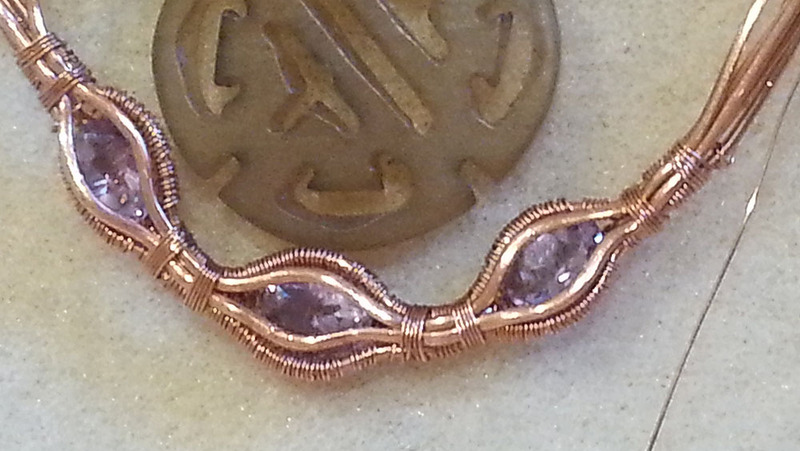 2nd: I should have done the sunray / Zig Zag circular weave incorporating the core wire from the bezel setting - this would have given me 8 wire ends to play with. 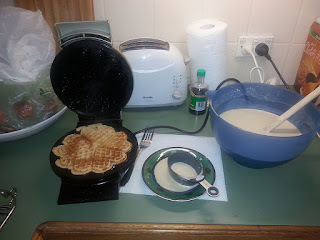 What I actually did next was to get straight into the stone setting Basket weave concept because I was so keen on it. 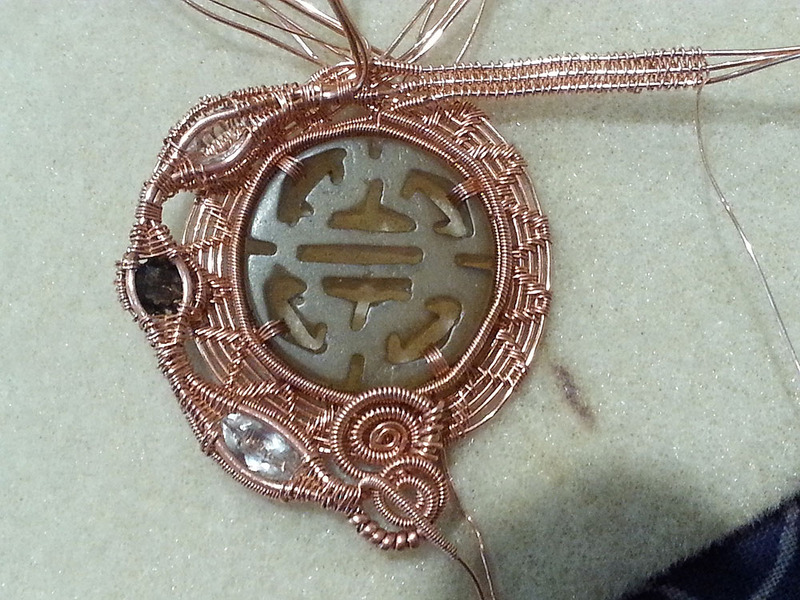 So the bezel setting core wire was joined with 2 more core wires, the 2 half rounds and coiling and off I went. So the 8 ends of the Sun Ray/Zig Zag circle joined with the 9 wires from the basket weave settings to make 17 loose wire ends I then had to tidy up. Oh, the sunray / zig zag circle weave is one I learned form the Nicole Hanna Arabian Nights tutorial I posted about in January 2017. I modified her 6 wire one to a 4 wire one for sanity sake. It ended up being a great base to which I could anchor other features or terminate wires. This is now representing 15 hours of work. Here is the 17 armed septendec-apus in all its messy, spaghetti bowl glory. I was reminded a bit of Medusa or the live Devil's Snare vines from Harry Potter books when I kept getting coiling wire caught up in it all. The next step was to start taming those 17 wires. I love weaves that use up a lot at once. A 3-core Figure 8 used 3 nicely. I also used a 2-core weave also learned in Nicole Hanna's tutorial - the weave one top right in the below photos. And covering up enough wire to be decorative is one thing. But the ends! What to do with the ends!! In the case of the 3-core Figure 8 weave, I coiled 2 core wires around one. Start with the core wire nearest the um, Live wire I guess? Then snip. The take the further core wire and keep coiling around the live wire - using coiling wire to hide things. 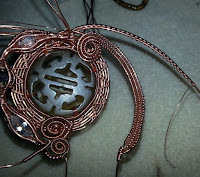 I used that one wire to coil around the base of a spiral. Spirals are also a GREAT way to not only use up wire ends, but as anchor points. In the photo below, both spirals are working overtime. 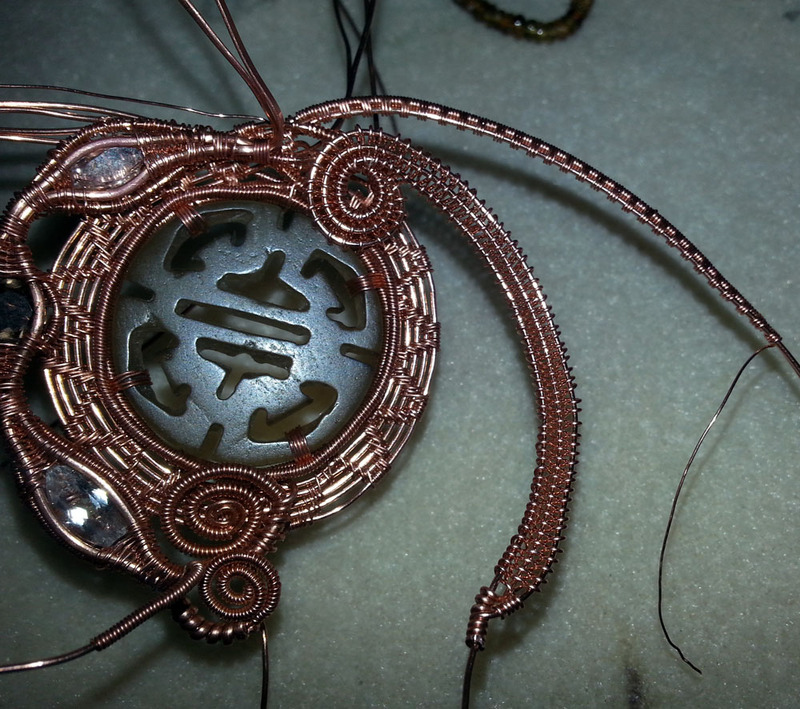 The beginnings have half round wire ends coiled up neatly. 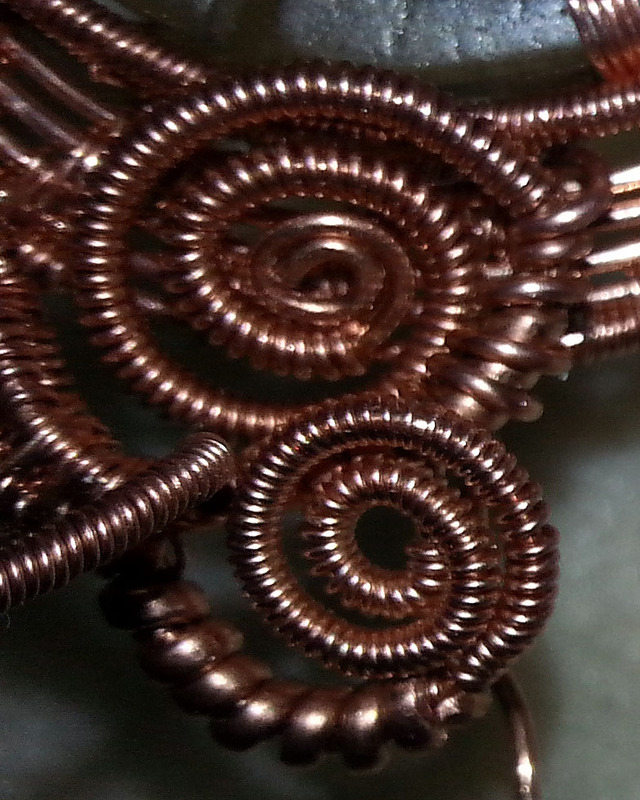 I also coiled another core wire on top of the half round coil on the top spiral in photo below. 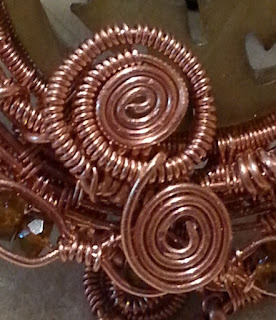 Spirals are also a great place to anchor ends of wires and then HIDE those spots. They should be locked into place though or they can catch on things and unravel. I've used a spiral to lock another one in place in below right side photo. On one side, I used another 2 core wires (0.6 mm ones) to accent Tourmaline beads threaded on a 0.4 mm wire in a circle. This is to decorate the side without the set faceted stones. The 2-core Nicole Hanna weave was brought to the this side too since it was looking a little plain compared to the opposite side. On the "front" side, there was the 3 set faceted stones. The 3-core Figure 8 was chunky enough to balance the stones on the other side. 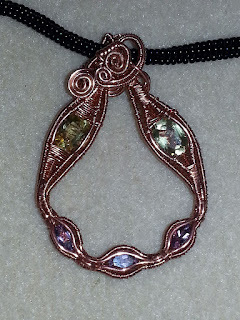 I wanted a bit of dark on both sides of the pendant so I used another end to coil and trap a boulder opal bead in place to balance the dark smokey quartz. If you compare this photo to the right to the front above, you will notice an additional spiral at the bottom. This is the final end of the 3-core Figure 8 decoration. There is also a new spiral at the top which anchors the bail closed. 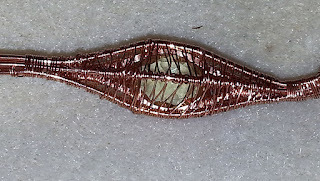 3 more wires became the base of a 3-core X-wrapped Bail, but I kept the ends poking out on both sides of the pendant to use in spirals to hide the base of the bail which was looking a little rough on both sides. 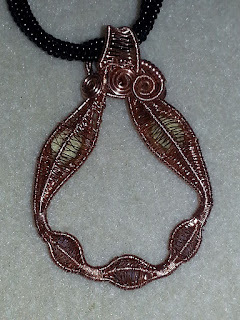 The final front of the pendant. Another curly wire on top but otherwise finished. 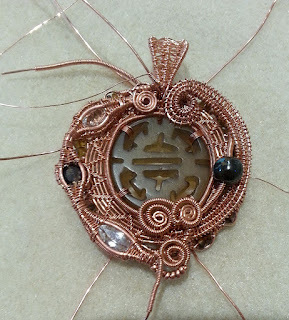 The final back side of the pendant. 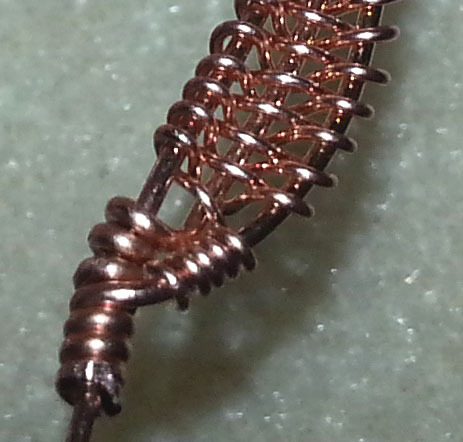 I balanced the 2-core Nicole Hanna weave on the right with a single core wire coiled with 0.4 mm wire and then another 0.6 mm core wire loosely coiled. 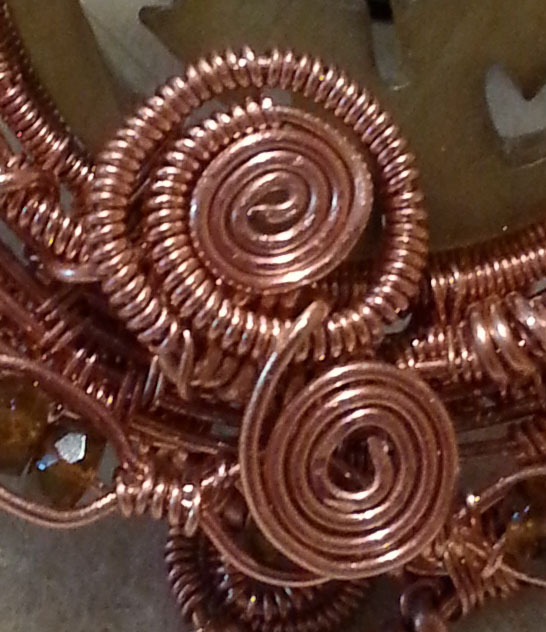 The bottom spirals are working overtime with about 5 other wires wrapped around them at the base - then hidden underneath. All up, both pendants represent about 35 hours of work. Pretty darned pleased with the results here! One thing I still struggle with today is how to further my skills without spending a fortune. I mean, while my jewellery is something I love to do passionately, I don't want to work it seriously enough to earn full time money. So there is not a lot of income coming in to support expensive education bills, and alas current trends are for local Tafe and Tech colleges to shed 'extraneous' curriculum like jewellery making so I would have to travel far indeed to take classes. On the other side of the coin, while face to face classes dwindle in traditional education avenues, the internet based education opportunities are opening up faster than I can keep up with new sources. Not only that, but as more competition comes to the market, the quality of content and instruction is improving vastly as everyone clambers for their little slice of the market pie. Enter me, Where to go, what to do! Between Youtube, Instructables, people's personal design blogs (like mine) and many new sources, jewellery (and crafting) enthusiasts have never had it so good for the education opportunities available all at a click of a few buttons. And let's be honest, it's always fun to learn a new thing! 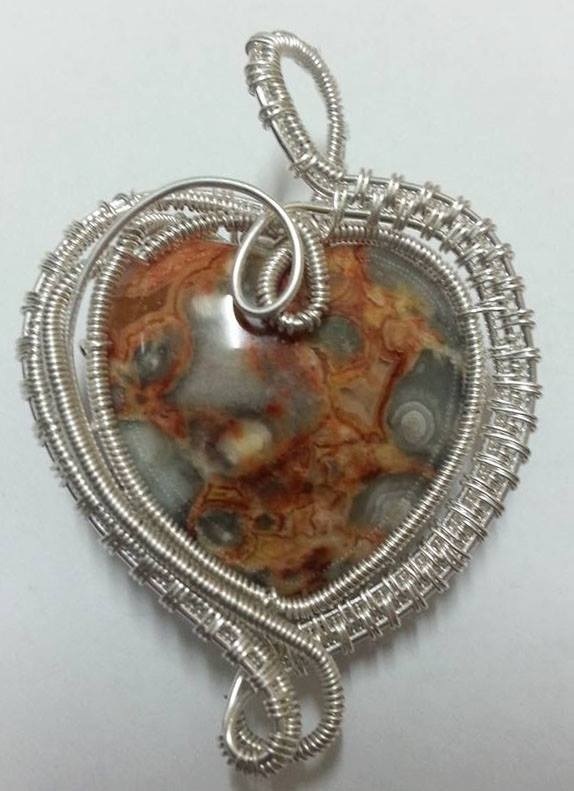 I was given the challenge of setting in sterling silver wire a carved heart stone without any holes and both sides were curved. I knew how I wanted the final pendant to look, slightly asymmetrical with deeper wire heart shapes to emphasise the gentle stone shape. But I have not tackled the 6 strands of wire wrapping before and .... what to do with twelve ends! My attention has been drawn to Nicole Hanna of nicolehannajewelry.com and her drool worthy tutorials. I chose the Arabian Nights for USD $6 as a good base line for learning that beautiful asymmetric, chunky weave look. It turns out that the ends just have to be cleverly nested behind the scenes as it were. I followed her tutorial faithfully and was very pleased with the result. I wasn't happy with the tiny tiny bail that is supposed to be a simple cut jump ring. I like the bail to be a complex part of the design and big enough for numerous different chains. So I was ready to attempt the heart setting now with my new skills. Argentium Silver in 0.8 mm and 0.4 mm round wire. This used about 50 cm of the 0.8 mm and 4-5 meters of the 0.4 mm. 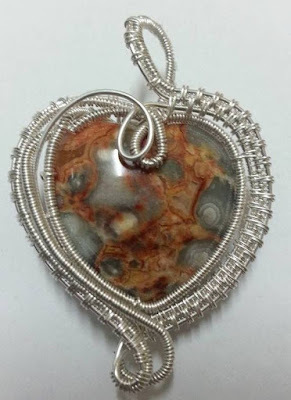 The stone I think is crazy lace agate made into the shape of a heart. Then comes the exciting point when to really incorporate what has been learned in a tutorial. Another project I have wanted to do was create an interesting pendant where the front AND the back are both beautiful designs and tidy. 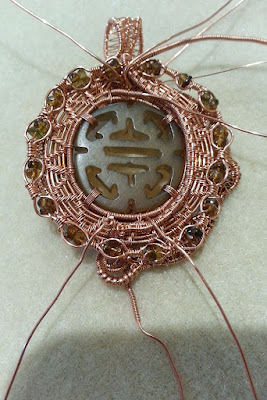 I found the in the Arabian Nights tutorial with 6 wires weave (I used 4 wires in my pendant) was very handy for creating a base onto which I could attach, anchor and terminate wires. I also used the two wire weave from Arabian nights on the right side below. Learning new techniques and then incorporating them into your own designs is a very exciting part of continued learning. I'm already thinking about my next tutorial. Unsure if I mean making one for my blog or buying one though! I know that I don't have a lot of followers or views, but thought I'd put it out there that if you have a question about metal work, wire work, beading, sewing, knitting that I might be able to answer - drop me a line and I'll see what I can do for you! Hammers come in many shapes and sizes for jewellery making. There are many specialised hammers, too many to mention. The big question is which to use when? How many does one need to buy in order to successfully do cold connections or other jewellery techniques? Those are very loaded questions indeed. Some basic understanding of use, shape and result is useful to know what hammer needed for the job required. One important thing to keep in mind, do not use highly polished, mirror finish hammer faces to strike punches or stamps as this will mar the surface of the hammer. Then when using the same hammer face later on, that mark will transfer to metal being struck. Use the hammers for their appropriate use! The biggest bane of having my workshop downstairs in our defunct garage, is the damp. The back walls are exposed bedrock that weeps water for weeks after heavy rains so no amount of anti-humidity products or mechanisms are viable. The roughest effect is the rust on my budget steel tools. Budget because my hobby exists on a minimalist income since I am not full time professional. Not only does it make the tool look awful, but soft steel becomes pitted with bumps and divots as the steel is oxidised into rust. But these tools can exist happily with a bit of care. Headpins are an expensive finding to buy when you are making dozens or hundreds of dangles for a piece of jewellery. Not to mention the frustration of locating a head pin the exact shape or style that is required for the specific bead in the right metal. 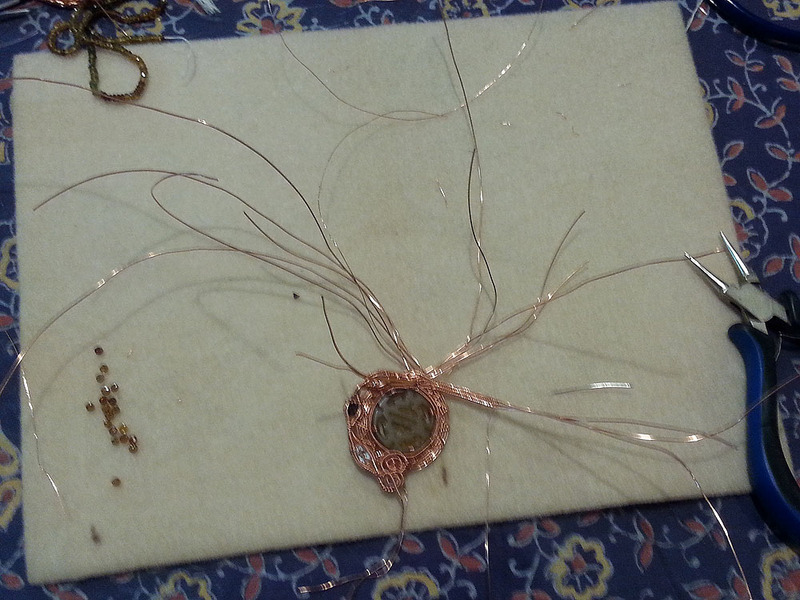 Especially when working with fine holed beads, what a nightmare! With a wire cutter, round needle pliers and some continuous wire, a head pin can be made in under a minute for a fraction of the cost, especially if using silver, gold filled or gold wire.